Background: Crested Geckos are native to Southern Grand Terre, New Caledonia and at least one small nearby island. Due to their ease of care and variety of colors and patterns they have become very popular as pets. Enclosure Creation & Requirements: Babies and young juveniles can be housed in a small or medium Kritter Keeper or an enclosure of similar size. It is better to keep them in a smaller enclosure when they are young so they can easily locate food. Once they get older, around four months of age, they can be moved to a larger space measuring at least 30 ½ x 12 ½ x 12 ¾ (20 gallon long aquarium). Up to three crested geckos can be housed in a 29 gallon aquarium or comparable enclosure. Males should never be housed together as it may result in fighting but females can share an enclosure but make sure that one is not dominating the other(s) and be prepared to separate if required. Crested Geckos are an arboreal species so height is more important than floor space when choosing housing so if you decide to go with a 20 gallon long stand it upright so your animal has more room to climb. There are several options for substrate. You can use paper towels or a soil substrate such as EcoEarth. It is recommended to use paper towels for babies to ensure they do not ingest the soil and to better track their bowel movements. It is important to provide lots of places for your crested gecko(s) to climb and hide. You can use live plants (safe choices include Sansevieria, Peace Lilly, and Caladinn) or fake plants and vines for climbing and hiding as well as pieces of bark and foam tubes for them to climb, hide in, and perch on. Crested Geckos do not require any special lighting and are comfortable in room temperatures (72-79 degrees) and can handle night time temps dropping down to 62 degrees though they should be kept higher if possible. Exposure to temps 80 degrees and above for any extended period of time will cause distress and possibly result in death so avoid at all costs. The enclosure should be misted once to three times a day to maintain humidity levels between 50-75%. Enclosures should never be entirely composed of a mesh material as it does not hold humidity properly. Diet: There are several options available for feeding your crested gecko(s). One option is using a commercial diet known as GCD (Crested Gecko Diet) which usually comes in powder form and is mixed with water and then given to your animal. GCDs are created to meet all of the nutritional needs of your crested gecko and additional supplements are not needed with this diet option. Babies can be fed every evening and juveniles and adults can be fed every other night. Food should not be left in the enclosure for more than 36 hours. Another choice is to use GCD as well as live feeders. Offering live feeders to your crested gecko can accelerate their growth but it also carries the risk of introducing parasites to your animal so that needs to be kept in mind. Appropriate sized feeders can be offered once a week. Appropriate feeders include crickets, roaches, as well as silk worms. Remove any uneaten feeders as they can stress your animal if left in their home. Regardless of the diet you choose, crested geckos should be fed in the evening as they are nocturnal and active at night. Note: Do not need your crested gecko(s) baby food. It was once an accepted diet practice but has been shown to lead to many issues so please avoid. A small water bowl, heavy enough to not be knocked over, should be available at all times. Handling: Handling should be restricted to twenty minutes at a time about every other day to not cause stress to your animal. Crested Geckos can be jumpy, especially as babies and juveniles, so it’s important to hold them over a soft surface such as a bed (pictured to the left) to ensure they do not get hurt if they leap away from you while handling. To help get them used to handling, you can put hand in front of hand and allow them to walk forward that way and get used to human contact. Never grab your Crested Gecko as they may view it as an attack and drop their tail as a defense mechanism. Try to scoop them up gently if they escape from you. Age Determination: Determining a Crested Gecko’s age can be difficult if you do not know its hatch date. You can measure your Crested Gecko from the tip of its nose to the end of its tail to see if it’s near the 7-10 inches of a full grown adult. You can also weigh the animal in grams to try and determine its age but Crested Geckos grow at very different rates due to differences in diet, husbandry, and genetics. Reproduction: Females can lay infertile eggs so female Crested Geckos over a year old should be provided a laybox where they can lay their eggs. A laybox can be made out of a small Tupperware container with a hole cut in the top for the female to crawl into as long as several small ventilation holes with a moist moss substance inside. If you plan to breed Crested Geckos, it is encouraged that the female be over a year old and at least 35 grams. The male should be comparable in size. If the breeding is successful, the female is considered gravid and should lay 2 eggs every thirty days. Commonly Seen Ailments: MBD (Metabolic Bone Disease), Dehydration, FTS (“Floppy Tail Syndrome), Incomplete Shed, Parasites. A wonderful site packed to the brim with information on crested geckos including basic care, health, and breeding. 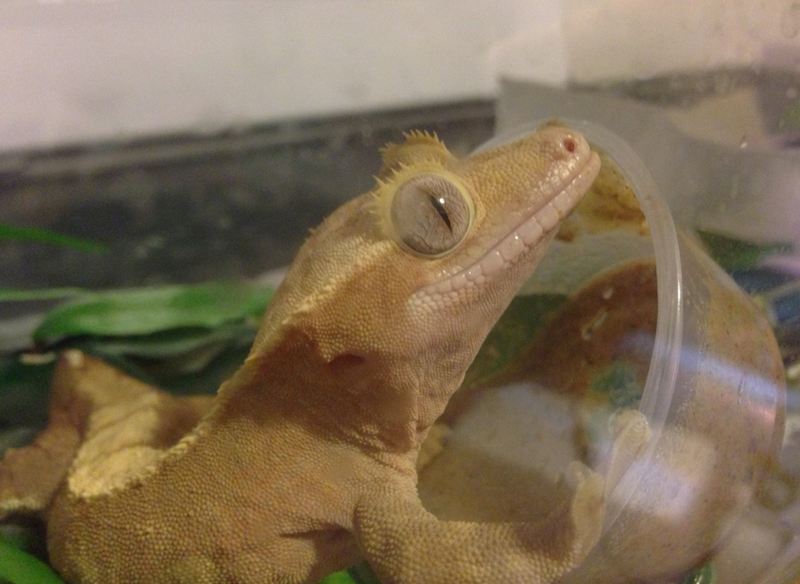 A small scale breeder with great, easy to understand information on her website with a crested gecko care sheet broken into small sections that anyone can grasp. A welcoming forum for any and all who are interested in crested geckos or other gecko species. Talk to experienced keepers, breeders, and other enthusiasts about these animals. In-depth article written by Allen Repashy about his pre-packaged reptile foods. Interesting and important read for keepers who feed these quality products. Crested gecko care sheet focusing on bringing home a new baby gecko.